There are, furthermore, several unrecognized countries and independence, secessionist, autonomy and nationalist movements throughout the world. Unincorporated Territory or Outlying Possession: An "unincorporated territory" or "outlying possession" is an area over which the Constitution has not been expressly and fully extended by the Congress within the meaning of Article IV, Section 3 of the United States Constitution. "We have never really been given a chance to say what we want to be," says Marilyn Krigger, co-chair of the commission appointed to oversee the referendum. These specks of land, which Columbus named for St. Ursula's legendary 11,000 virgins, have been dominated by foreigners ever since Columbus captured several Caribees/Kalingo people in the vicinity. The flags of six nations have flown over these islands since Christopher Columbus' second voyage to the New World in 1493.
hey signed their letter July 4, 1776. 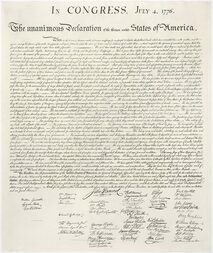 Yes, believe it or not, a mere 30 lines beneath the statement “All men are created equal,” the Declaration of Independence refers to Natives as “merciless Indian Savages.” Making it abundantly clear that the only reason the founding fathers used the inclusive language “all men” is because they had a very narrow definition of who was and who was not human. According the Declaration of Independence, Natives are dehumanized as savages who stood in the way of westward expansion. Read the entire article here. Crispus Attucks was a direct descendent of John Attucks, an Indian executed for treason in 1676 during the King Philip War. Crispus Attucks symbolizes the dilemma faced by many Indian people over the past two centuries. The problem is not just that of having a genetic heritage from more than one “race”, but that the fuzzy notion of race inherent in American racism assigns an individual to only one race. In addition, the old notion that “inferior blood dominates” means that many people of Indian heritage were considered Black by the dominant society. Today there are some who feel that mixed blood people should be able to celebrate all of their heritage, not just part of it." Read the entire article here. 2018 : WHO ARE THE AMERICAN ABORIGINES ? Very good historical pictures and illustrations. Knowing The Information For Yourself Is Your Duty!!! "Black Power in an International Context"
Educators and community organizers from around the U.S. (Queen Tahiyrah, Professor Carl Tone Jones, Elaina Porter, and Agyei Tyehimba) will host a LIVE internet roundtable discussion on "Black Power in an International Context." Puerto Rico petitioning for independence.